Beaumaris TownThe name Beaumaris is based on the Norman 'beau marais', meaning 'fair marsh', a description of the site chosen by Edward I for the last of his 'iron ring' of castles, constructed in his bid to control the Welsh. Begun in 1295 and never finished, Beaumaris Castle is a United Nations World Heritage Site. The town itself offers a wide selection of shops, bars, pubs and restaurants and the main street features half-timbered Tudor houses. 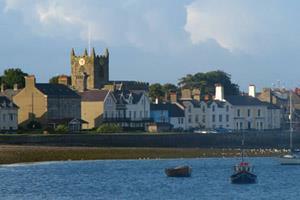 Its waterside location on the banks of the Menai Strait means it's a popular place for yachting and watersports. For sporting enthusiasts there are two golf courses within easy distance and plenty of opportunities for walkers. The name Beaumaris is based on the Norman 'beau marais', meaning 'fair marsh', a description of the site chosen by Edward I for the last of his 'iron ring' of castles, constructed in his bid to control the Welsh. Begun in 1295 and never finished, Beaumaris Castle is a United Nations World Heritage Site. Visit Beaumaris Court, constructed in 1614 to this day almost orders you to get up and proclaim out loud ‘not guilty'. Stand in the dock and learn about Anglesey's most notorious criminals. Beaumaris Goal gives a fascinating insight into the world of the prisoner in Victorian times.